Daily Illuminator: Have A Katie Cook Munchkin Mix-Up! September 21, 2017: Have A Katie Cook Munchkin Mix-Up! Mixing Munchkin sets is one of the finest things in life - taking a perfectly fun game and adding more bells and whistles can take your table time to the next level. But where do you start? We've talked about combining sets before, based on themes, but today we're going to suggest something new: mixing sets based on the artist! 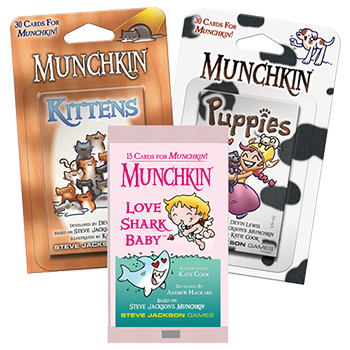 Katie Cook started off illustrating some of our cutest and most popular booster packs, like Love Shark Baby and Munchkin Puppies. She has since granted her visual style to multiple sets. She even has two entries in our Guest Artist Edition line! Her rendition of Munchkin Oz is complete with all the trappings of the L. Frank Baum classic - team up with the Tin Woodsman and Scarecrow to take on King Krewl and his minions! Munchkin Cthulhu Guest Artist Edition is Katie's take on the dark arts and cultists, with some troublesome investigators thrown in for good measure. Mixing those sets would create a fantastic romp through the Emerald City, complete with tentacles! But why leave it at that, when you can enhance the fun? Adding the recently released Munchkin Spell Skool gives you a bevy of new magic items, like the Twofer Wand and Fire Drill, plus a host of new magic monsters, such as the imposing Moldy Mort! And if that's not enough? Add cats. Why cats? Because why NOT cats?! Munchkin Kittens is one of Katie's most popular contributions to our lineup. This mini-expansion adds 30 cat-themed cards to your game, and can mix into any deck . . . but I'd recommend this mashup simply for the combination of cute and deadly! What better to fight a Bully than a Catapult? And you know the Mewsical Group would be teaming up with enemies of Oz to fight you. You can find the Guest Artist Edition line at your local game stores, and Munchkin Kittens is now back in stock in those stores and on Warehouse 23! 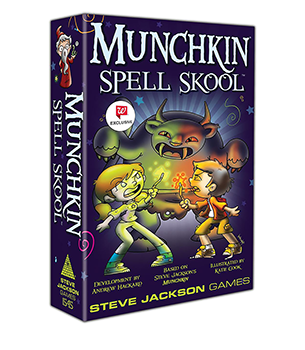 A trip to Walgreens will satisfy your Munchkin Spell Skool fix, as well. Mix-up your next game night!